June 29, 2017, 10:07 a.m.
New YouGov Omnibus CityBus research across 16 cities reveals that Belfast is the UK&apos;s fake tan capital, with one in five (19%) people in the city saying they have worn fake tan in the last 12 months. Belfast takes the self-bronzing title by some margin – Sunderland, in second place, is on 15%, with Liverpool in third on 10%. Distance from the equator dosn&apos;t seem to be a key driver when it comes to getting sunshine from a bottle. The survey found that people in more northerly locales - such as Glasgow (8%) and Newcastle (6%) - were all less likely to use fake tan than those in Northern Ireland&apos;s capital. Belfast also tops the table when it comes to tanning moisturiser use, with 15% saying they had built up a tan using the product during the last year. Of course, fake tan isn’t the only way to maintain a sun-kissed look and the research also looked at which city&apos;s residents are most likely to use a sunbed. It finds that people in Sunderland (7%) are the most likely to lie down and lap up the UV rays from a tanning bed. Sheffield is traditional sunbathing capital, with almost a third (32%) of people in the steel city getting bronzed in the classic way over the last twelve months, slightly ahead of Liverpudlians (31%). 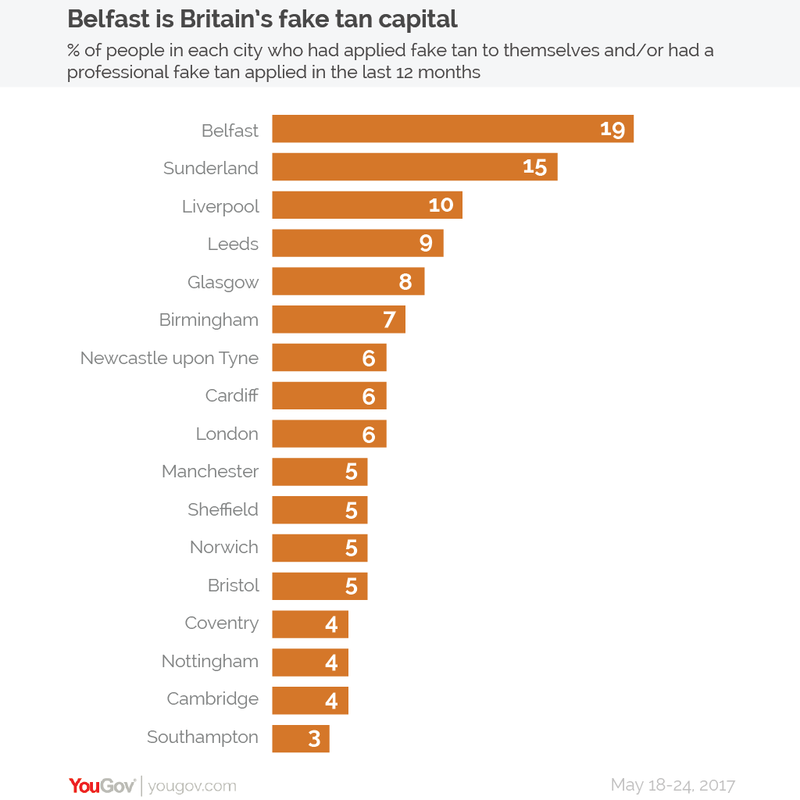 Belfast also tops the list when it comes to people considering applying fake tan in the next 12 months, with over a quarter (26%) of those in Northern Ireland&apos;s capital considering doing so. In fact, they are equally as likely to say they would consider getting a fake tan as they would to consider getting one by sunbathing. In this, they are tied with Cambridge as the city least prepared to lie back and get sun-kissed in the natural way. Belfast’s tanning salons be warned though: the days of fake tans may well be numbered. Recently, scientists announced that they had invented a new chemical that causes skin pigment to darken without exposure to UV light. Creating fake tan this way is in fact only an added bonus for the scientists’ real goal: to help reduce rates of skin cancer by making skin more resistant to harmful UV rays.